Heat oven to 350°F. 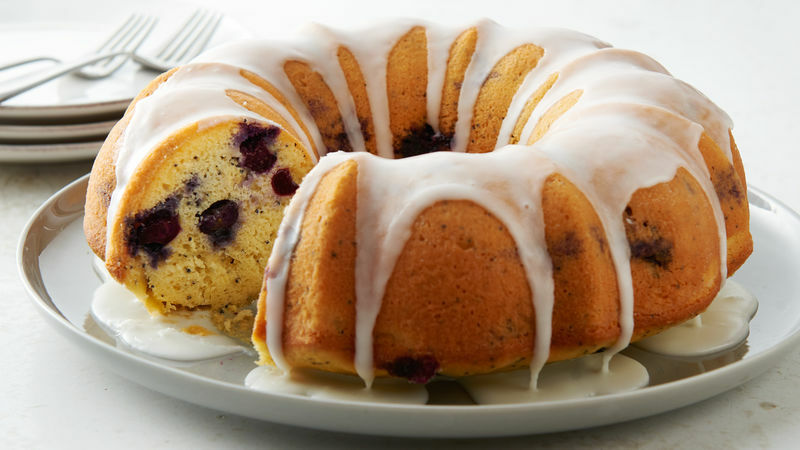 Generously spray 12-cup fluted tube cake pan with baking spray with flour. In small bowl, place blueberries. Remove 1 tablespoon dry cake mix; sprinkle over berries, and toss to coat. Set aside. In large bowl, place remaining cake mix, cream cheese, lemon peel, poppy seed, water, 1/4 cup lemon juice and eggs. Beat with electric mixer on medium speed 2 minutes, scraping bowl occasionally. Stir in coated blueberries and any remaining dry cake mix. Pour into pan. Transfer cake to serving platter. In small bowl, beat icing sugar and 2 tablespoons lemon juice with spoon until smooth and spreadable. If too stiff to spread, add additional lemon juice, 1 teaspoon at a time. Spread over cake. Store loosely covered at room temperature. Using baking spray with flour is a much easier greasing method when coating Bundt pans. You could also use shortening plus flour but it can be tricky (and messy) making sure every little corner is greased. Spraying is an easy way to make sure everything is covered. Make sure your bundt pan its well sprayed, but not so much that it pools in the bottom of the pan. If that happens, wipe out the excess since this could bake into the batter and cause an unattractive crumb. We know it’s hard, but do your best to wait the specified time before turning the cake out. It needs that much time to cool and be sturdy enough to hold its shape when tipped out of the bundt pan. If cake does not easily release from the pan, tip it back over and let sit a few minutes longer. Use a long thin spatula to help loosen sides to help it remove. (Don’t forget to loosen around the centre tube too!) Tip it over and give it several hard raps on the bottom of the pan to help it release. If it still doesn’t come out, you can pop it back in the oven for a few minutes then try again. Dusting fruit with a little flour from the recipe (or cake mix as we do in this recipe) helps prevent the fruit from sinking to the bottom of the cake. When pouring batter into the pan, make sure to spread it evenly. Especially with scratch recipes, rap the pan several times on the counter before baking to help eliminate air bubbles from batter. Choose a frosting that compliments the cake since you don’t want something too heavy or overwhelming. Bundts typically only need a glaze, thin ganache or icing sugar to finish it off.